(4.1/5)Slow Feed Cat Bowl allows you to slow down your pet when eating, re-educating poor eating habits and reducing vomiting. This maze dish works for small and large breeds and has been designed thinking of a heavy duty unit to be used daily in a busy vet clinic and with the goal of slowing down the cats eating, but without frustrating the pet to the point of quitting. Slow Feed Cat Bowl is made from bamboo fiber and rice husk, using the highest standard of quality and environmentally friendly as well. The feeder comes in colors: Beige/Ivory, Purple and Blue. Designed by professional veterinarians to be used daily in vet clinics. Heavy duty, durable food bowl. The bowl prevents overeating and obesity so it can be used as a diet bowl. 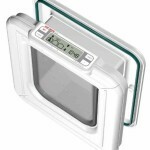 Helps to stop cats from inhaling the food and then vomit, preventing bloating. It slows the cat’s eating in a way that it won’t get discourage him from trying to eat the food. Keeps your pet working for its food, which reduces boredom. Environmentally friendly and fully degradable, made from Bamboo Fiber and Rice Husk. You simply pour your cat food into the slow bowl and your cat will have to eat from the nooks and grooves of it. This slows down the eating behavior since the cat needs to work a little to eat the kibble. Good help if you have a cat that eat’s the other cat food. It comes in various colors to match your decor. Check a video of the Slow Feed Bowl in beige color here. Some kibble might not get eaten by the cat if dropped in hard to reach areas of the maze. 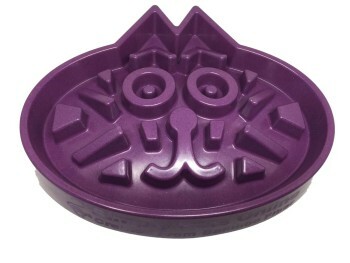 Slow Feed Cat Bowl is a good maze dish to slow down cats when eating, which reduces or completely eliminates cats vomiting. This is very important if you have a cat that likes to inhales food because you can help him or her to be healthier physically and mentally, because cats like to keep busy in working mazes. Unlike other types of slow feeders such as the Tiger Bowl, the Slow Feed Bowl features groves with 1.25″ deep that really makes the cat work for its food. It’s not only about dragging the kibble with its paws, but the feline needs to scoop it out somehow with its paws and claws to get it out of the grooves. 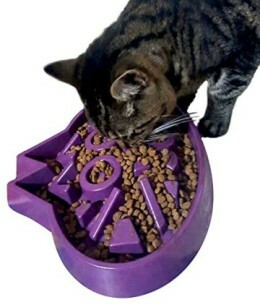 The maze dish could be too large and its grooves too deep for a small cat, especially if you don’t free feed your cat because if you pour only one meal in it, the food will be harder to reach than when filling the dish to the top. Other than this particular situation, the Slow Feed Cat Bowl is a very good slow down feeder that is highly recommended for medium to large sized cats that need to slow down when eating or for two cats that share the same bowl. If you have two cats and one of them bullies the other for food, the best solution is buying two slow feeders. You can save from 5% up to 30% when buying two or more units in Amazon.